I've just 'died'again. That makes the score: Trials = 3, Me = 0. 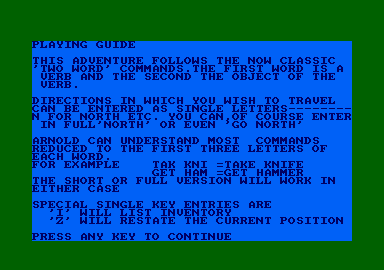 Not that The Trials of Arnold Blackwood keep score, it's much too sophisticated for mundane score keeping, rather, it is an adventure game, and a most unusual one at that. Arnold Blackwood awakes from a knock on his head to find himself suffering from amnesia, although he does remember his name and the fact that he is in the middle of Lord Erebus'estate. The eerie music adds to the atmosphere. Your help is enlisted to get him out of the mess, so you jump on his shoulders and proceed N, S, E, or W.
Will Arnold eat the other half of the kipper? Will Mexican Pete find his true vocation in life? Does the ORACLE tell the truth? It is very difficult to tear yourself away from the game and thereby ruin your train of thought. 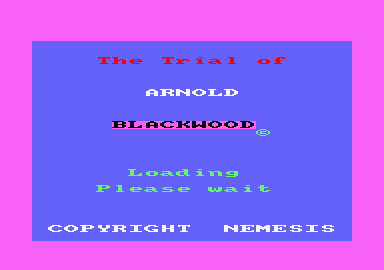 For those who enjoy adventure games, devious in their nature, yet humorous, thought provoking yet entertaining, I would seriously recommend The Trials of Arnold Blackwood. Now for another attempt, and this time when I see the Brick Wall I'll ............BANG HEAD? » Topic: Cheats, pokes ou solution pour "THE TRIAL OF ARNOLD BLACKWOOD"